Dear microdrummers, has been a long process but it ended. The microDrum 1 is ready to be printed. As you can see from the picture is an “all inclusive” card, that is, in the same board there are also 12 stereo jack (24 inputs), MIDI ports, USB and power. Also, big news, for the first time the card also supports audio output via the Raspberry Pi. The Raspberry Pi is connected to the card as you do with Arduino in classical microDrum. I wrote a version of SamplerBox in C, optimized for our instrument. Moreover, the introduction of Raspberry allows to use various types of screens (even touch), external sound cards (for example), and of excellent quality samples (as you know I use the Analogue Drums samples). 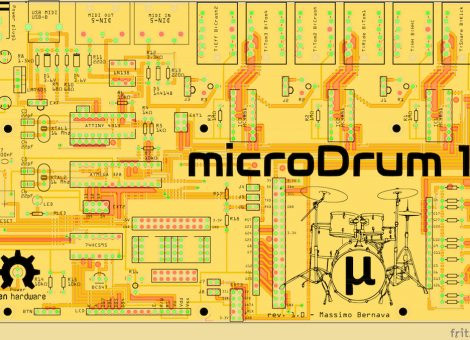 I not release code and diagrams until I get tested them myself but for accellerate the times again I ask for your trust: I put on sale the microDrum 1 with all welded including the Raspberry Pi, the sd card with optimized Linux Distro, and a set of samples.